While they were pleasantly surprised by last season’s success, coaches Michael Benedetti and B.J. Wright have even bigger plans for this season’s cross country team. After last month’s tryouts, the team has grown significantly from last year’s 13 members to this year’s 22 members. The first meet took place at Toro Park in Salinas on September 8. JV placed third in their race. Varsity also had a great first meet as parents, coaches, and teammates cheered on the runners. In the second meet at Hayward HS, the Frosh-Soph girls placed third as a team, with one runner medalling for being in the top 25 for that race. Last season, the varsity team qualified for CCS finals for the first time in over a decade. Determination and perseverance fuel the girls on the team as they encourage each other and learn to be better runners. 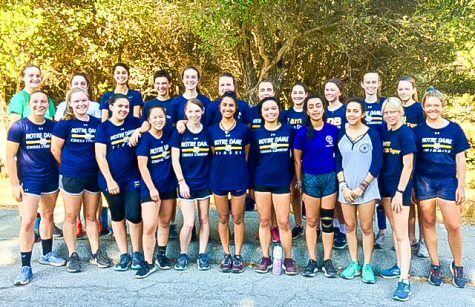 After an exciting team bonding trip to Yosemite, the NDB cross country team is stronger than ever and geared to reach their season goals. Jean Aquino ('21) is the Catalyst's Opinion Editor. She is a sophomore at Notre Dame High School.